Why should you participate in the next Global Service Jam? Read carefully the content below and check with your own eyes “Why you should participate in the next Global Service Jam” and if you have participated before, please let’s us know your experience and/or comment what you think about my experience afterwards. The idea of the Global Service Jam is to create in 48 hours a service that could change the world. The theme is secret and it is revealed during the first hour of the jam in each participating city. People are only able to share and talk in public about the theme after the last city has heard the theme. The service solutions are shared also when all cities around the world have completed the 48 hours of jamming. It is incredible how many amazing services are created, and I’m sure that someone really could revolutionize the world. The first Global Service Jam was created by the initiative of Markus Hormess and Adam Lawrence and took place on March 2011, where more than 1200 participants in more than 50 cities created about 200 unique service designs around the Theme “(Super)HEROES”. From 1st to 3rd of March 2013, almost 3000 participants were challenged to create a service around the theme “Grow^”, in over 120 cities, and they produced over 500 projects. The Helsinki Service Jam is a part of the Global Service Jam. The idea of the event follows the same idea of the Global Service Jam. It brings together creative, passionate people interested in creating brand-new real-world service designs, projects and initiatives which might make a difference. Helsinki Jam gathered almost 40 jammers and created 7 projects. The topic of the projects were: Tiny Tippers, LiveMemories, FamilysnApp, Grow your inner child, CAN I BUY ?, Eat Right and Friday at 7. I had the pleasure of working with engaged people with a lot of ideas: Hugo, Marit, Jussi, Jaakko and Gabriela. During the First day we made a reflection about the theme and we ended up with ‘growing old’, we talked about problems related to it. We prepared our research and we tried to come up with a plan for the following days. On the second day we went through the users interviews and we get a lot of inputs from it. We had a generating idea session where all of us presented some idea based on our findings. Two service design concepts were selected and we started to prototype and check with people what did they think about the idea and how useful was it. On the third day there was a short discussion and people tried to combine both concepts, horrible moment, but we kept improving our idea and we finally came up with a nice result. 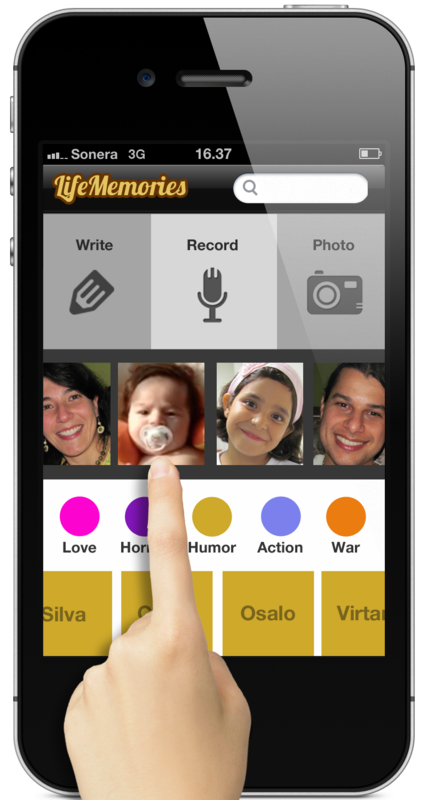 We idealized a mobile application called ‘LiveMemories’, where the aim is to keep life memories alive and don’t let them be forgotten. The audience of our application is members of a family. Basically you create family members´ profiles and fill them with stories; which you remember and other members can connect to those same stories, sharing their point of view. Current memories are also saved. 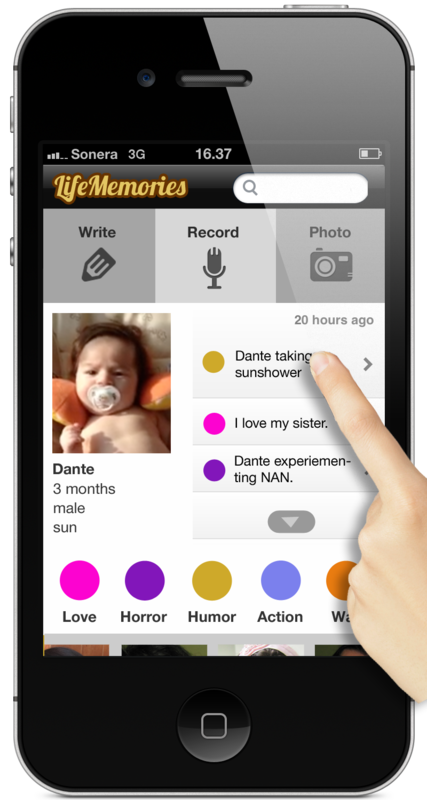 You can create videos, sound memories, pictures and short stories. In the end you have all the stories categorized by genres, as in storybooks, a funny way to search for life moments and a family tree easy to check. Even people who are not here any more could have a profile and the stories safe for the ones who would like to share what they know about them. Memories like: Hi Mom! How did you access the Internet before computers existed? – Could be shared with your closest member family or the ones are living far from you. The experience of spending your time with others to think about a service that could help a lot of people to better live their life is incredible and do the concept in 48 hours is very interesting, because you experience in short time many things that can improve your work, as communication and focus, for example. The organization of the event and all facilities provided from the sponsors made the Jam even more interesting, making possible to us really concentrated on the service. Laurea and SID students were well represented there. The participation of the all open minds, creative and humored people, really focused in the goals of the event – having fun, collaborating and making good services in 48 hours that could change the world. My group was patient and we were continuously working until the end, making possible the finalization of the service presentation. We had a lot of interruptions during the work, quite the opposite of the concept of “stop talking and start doing”. The time for create the service was short and the group members were unknown, we should spent mostly all time to dealing with each others and coming up with solutions for all the stages. Lessons learned should be included on the end of the event, not during. The presentations were not prepared for explaining the concept to the world and absent people on the final presentations perhaps didn’t get the same idea as the ones that were there. Maybe explaining the purpose of the concept presentation on the beginning of the event could help the participants. From my group side – After we presented the service, someone said – Let’s make it real! and other said – I’m done with you guys! And on that moment I thought if the whole work done and time spent was valuable, but after some seconds… I remembered about the success of our presentation and the good feedbacks we have gotten. And I hope the work for that haven’t stop on the last day of the Service Jam. Prepare your bag including – creativity, love, collaboration, joy, patience, open mind, respect, plaster, swab, glasses, paper, crayon, post-its and some snacks. Be prepared to have your ideas rejected and to collaborate with others ideas. Build a nice concept presentation. 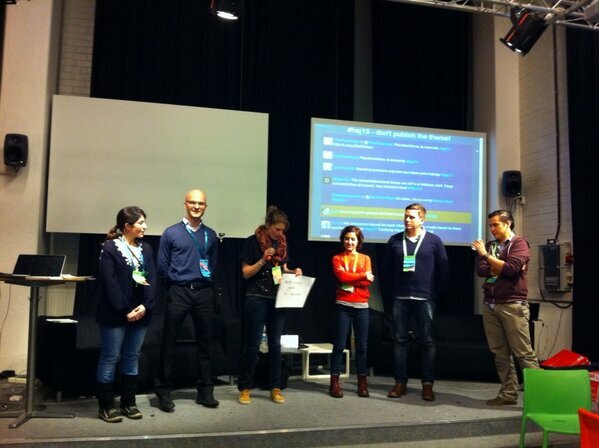 The next global service jam are about services to the public sector, the GovJam and it will happen in June 2013. See you there!